Unfortunately my trip was timed a month too early. 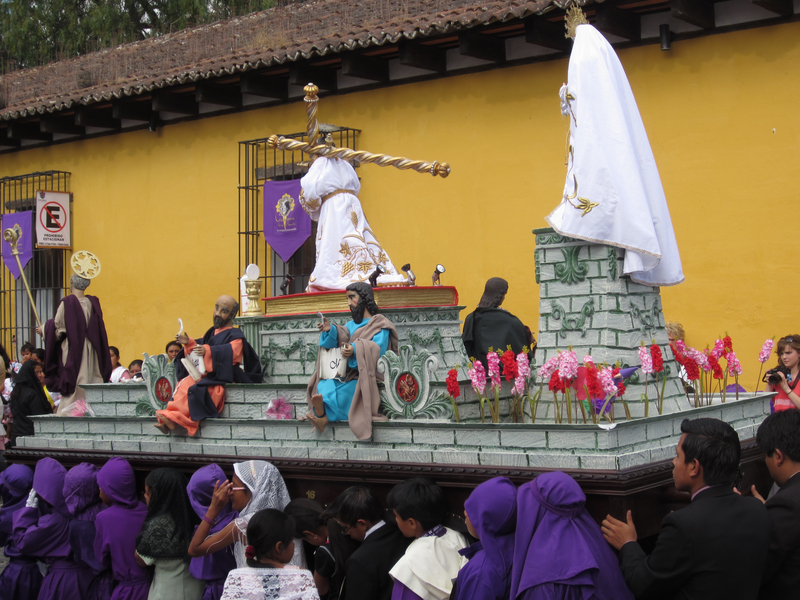 The height of Semana Santa happens the week before Easter. However, little did I know that smaller scale celebrations start on Ash Wednesday at the beginning of Lent. 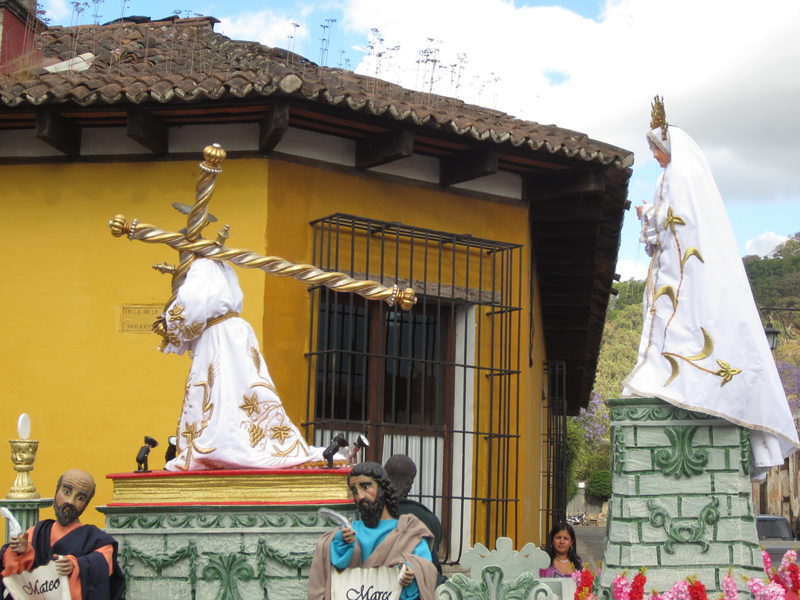 Thus during my short stay in Antigua I was able to capture a glance at the magic and sensational beauty of Semana Santa. Above is a glimpse of a spectacular Alfombra. 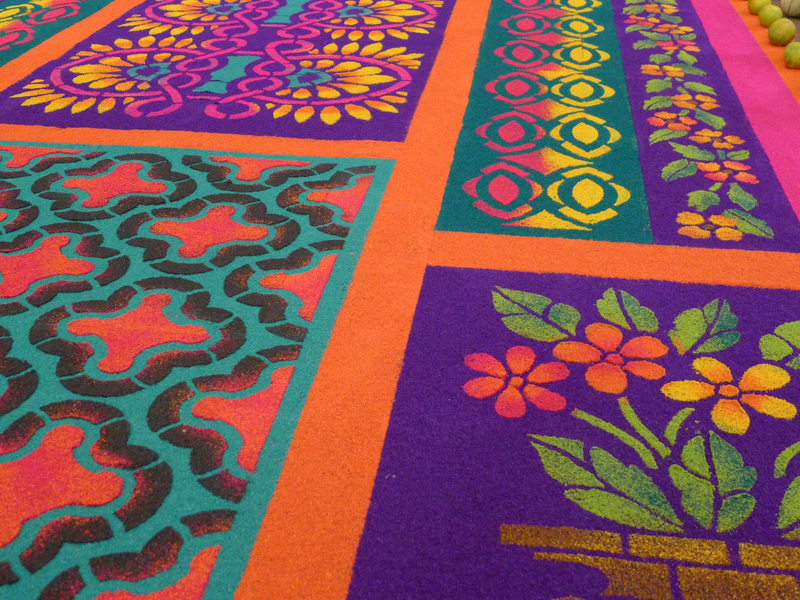 Alfombras are made of sawdust or sand dyed in brilliant colors and carefully constructed as a work of art. 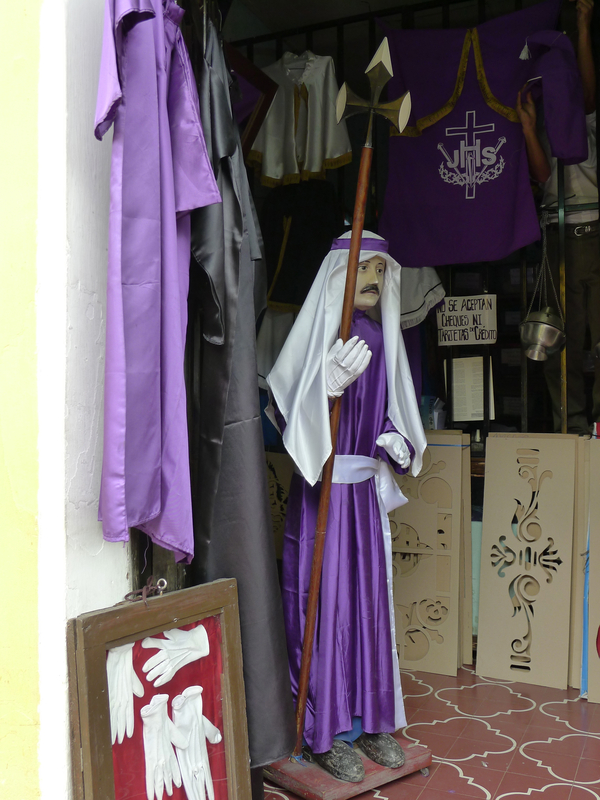 The first thing my friend Lucy pointed out to me as we walked down the streets of Antigua were the lovely purple and white Semana Santa flags. 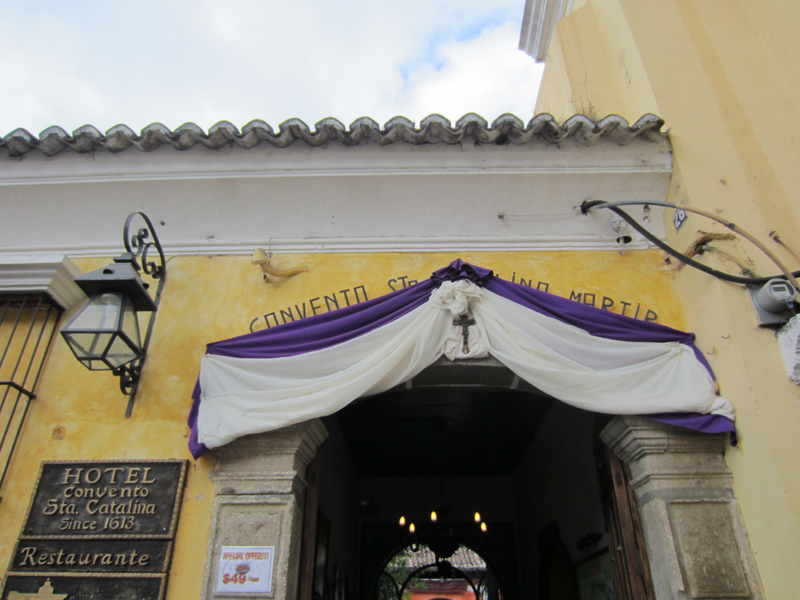 They were everywhere, decorating the buildings, awnings and churches throughout Antigua. 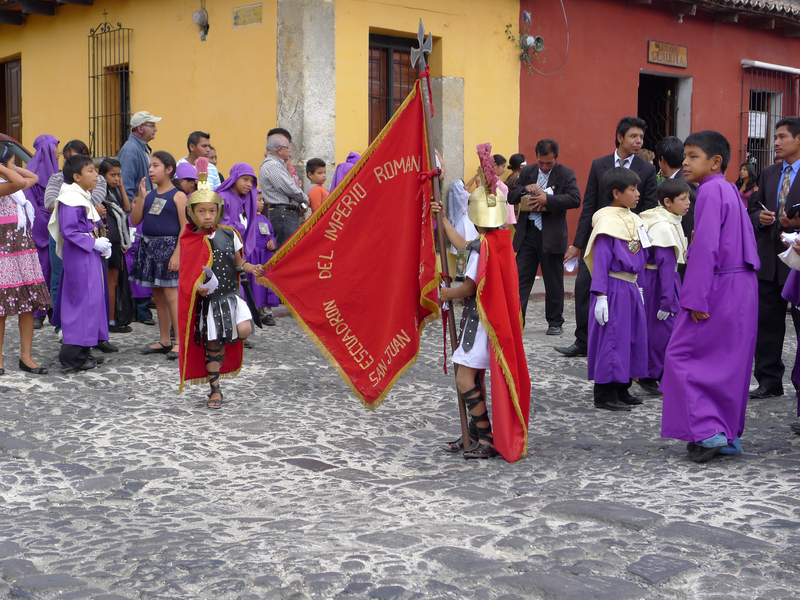 Purple is the color of Semana Santa and represents penitence. Purple is everywhere and can also be seen worn by the men, women and children who carry the large floats during the processions. 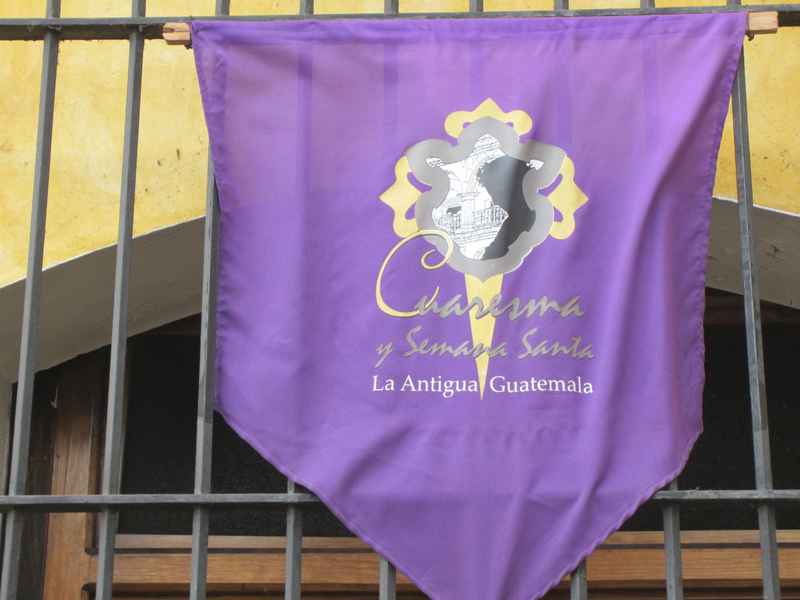 There are tons of places throughout town selling Semana Santa gear such as the shop below. 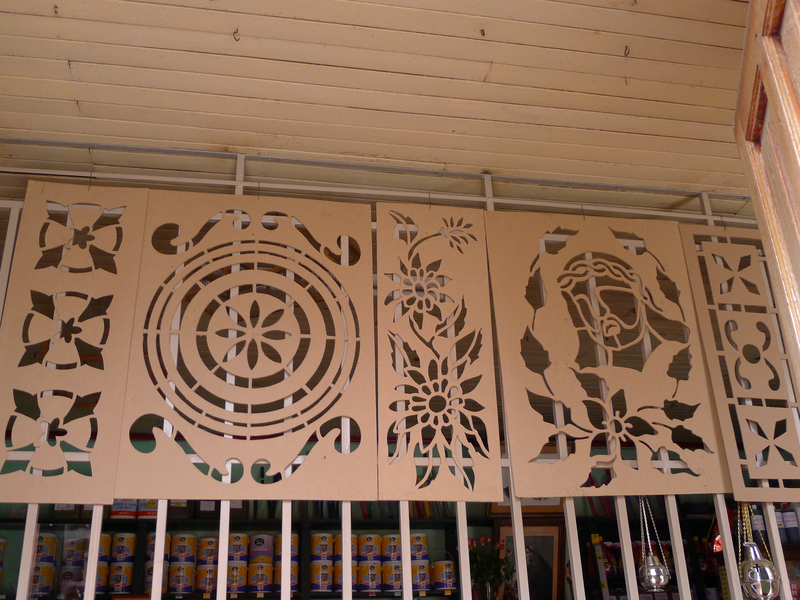 The moldings for making alfombras can be seen in the lower righthand corner. 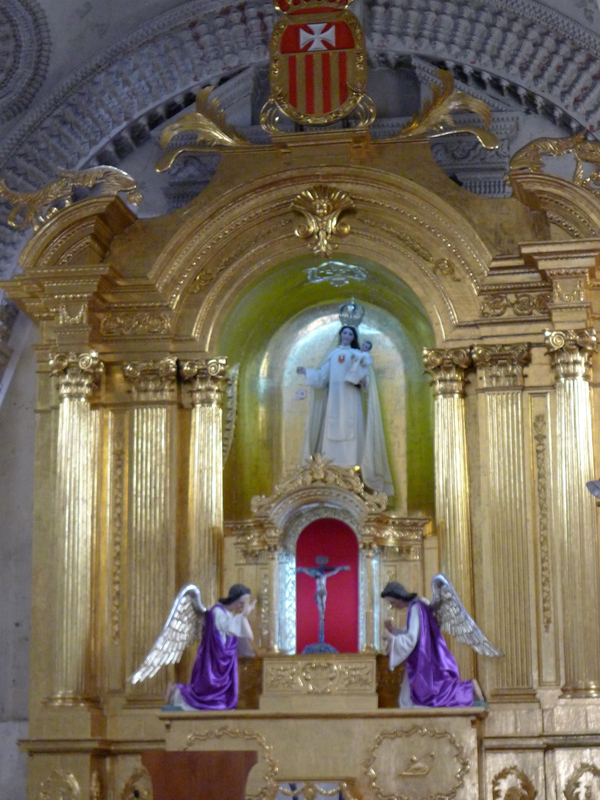 Inside the Catedral de Santiago, I saw my first alfombra and religious statues that would be used on the floats. 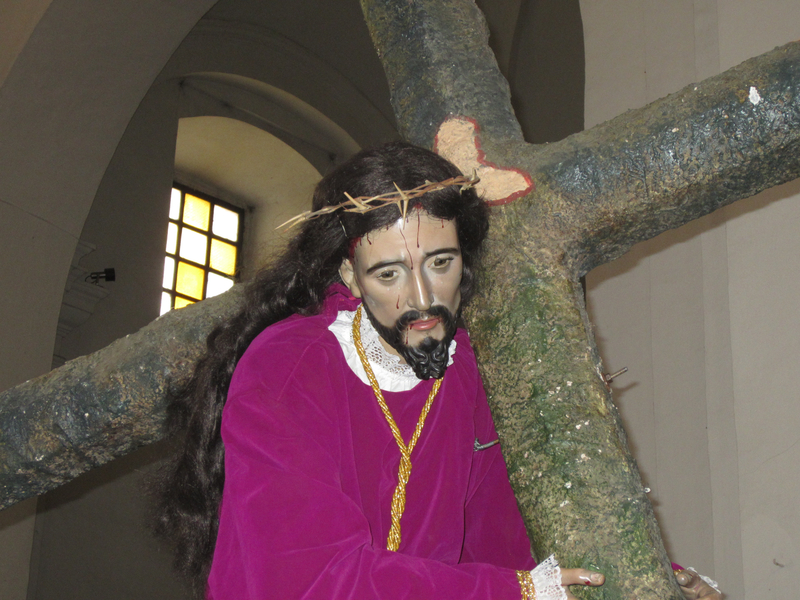 The sacred statues depict scenes of Passion, Crucifixion and Resurrection of Jesus Christ. They are hand-carved of wood, intricately painted, and are considered a work of art. 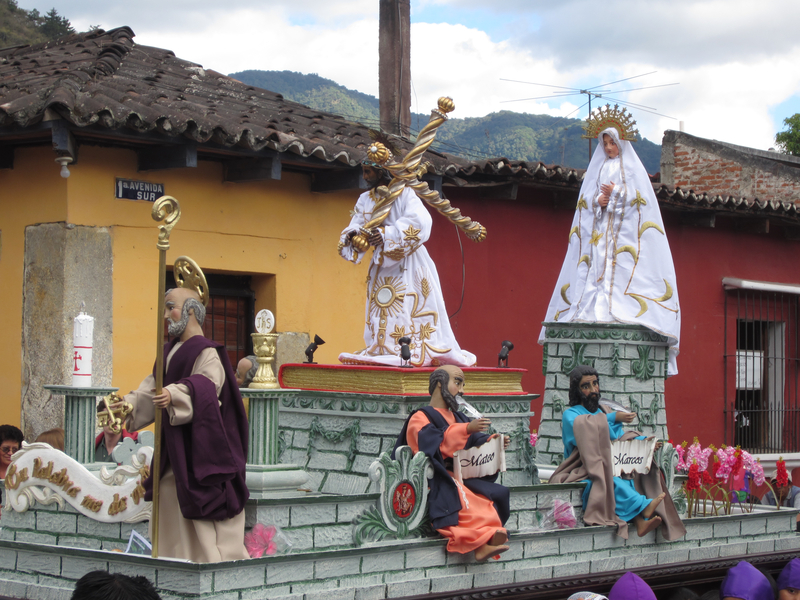 What is so amazing about these statues is that they are only a small piece of the enormous floats which are carried around by up to 100 men or women on their shoulders, throughout the cobblestone streets of Antigua during a procession. 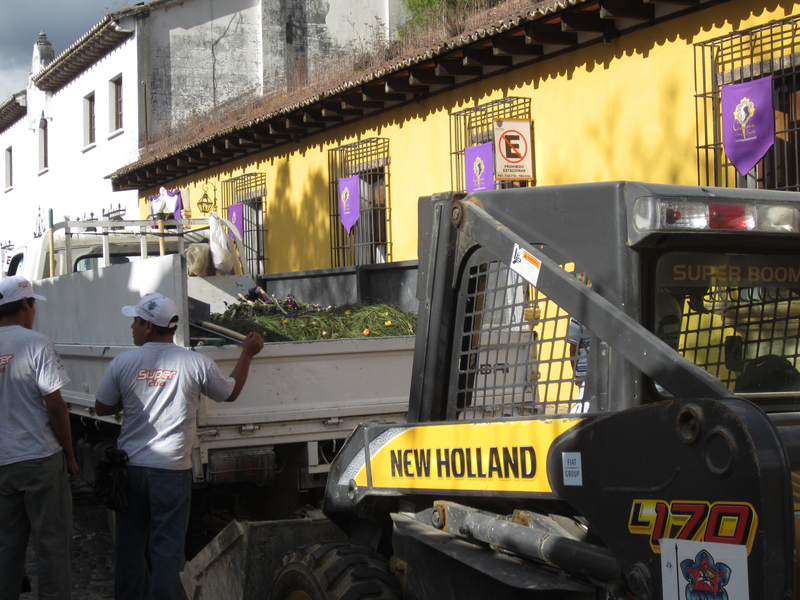 The floats generally weigh over 3,000 kilos/6,600 pounds and are carried throughout the entire city for hours. Given the enormous weight, each group of churchgoers generally carry the float only one block where the next team of 100 or so people take over for the next block. 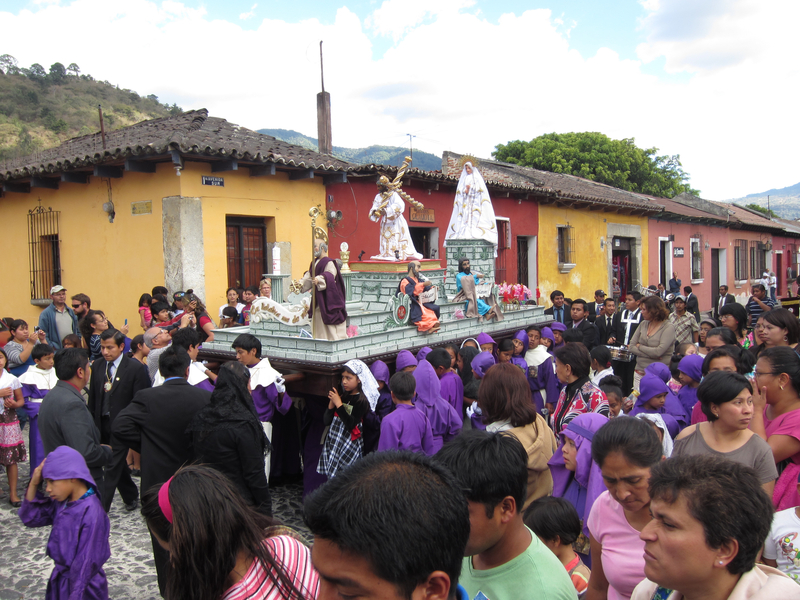 A single procession can require thousands of participants to carry each float and lasts for hours! (Source: All About Antigua Guides 2012). 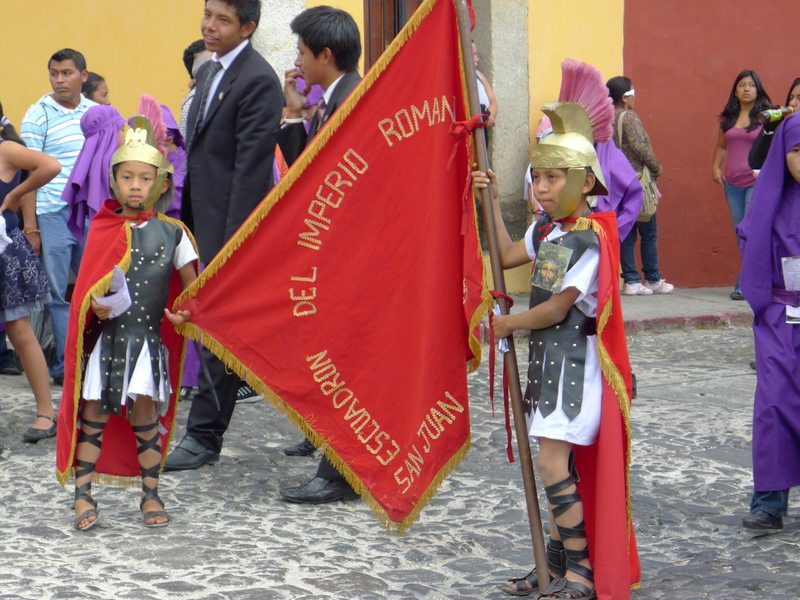 Later that afternoon, we were lucky to witness a procession by some of the local children. Here are some of the photos below. Above is the alfombra cleaner. 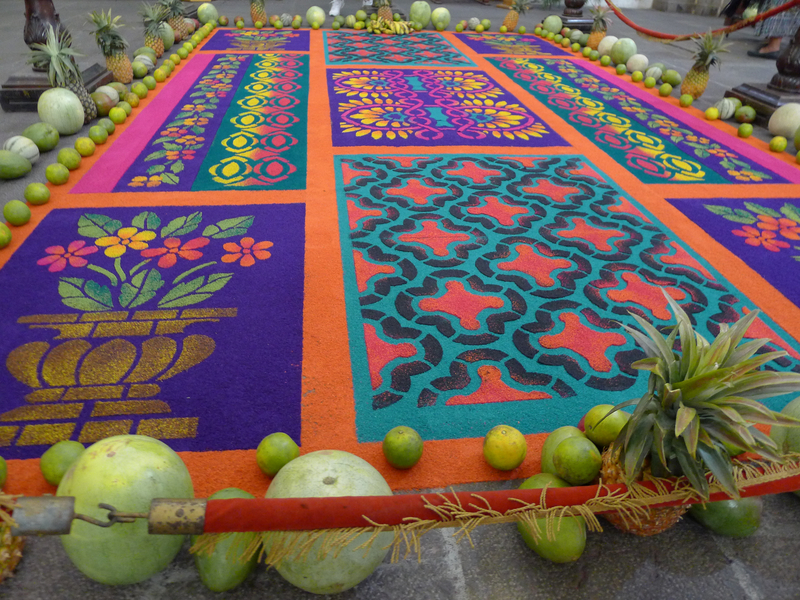 Each alfombra is placed on the street sometimes moments before the procession arrives and tramples it down. All that work and beauty destroyed in a flash! The gorgeous, colorful albombras are often a work of art in their own right. Each processional carpet is made with extreme care and artistic imagination. First, the mold is built as per below. Often this is selected several months before the finished alfombra is made. 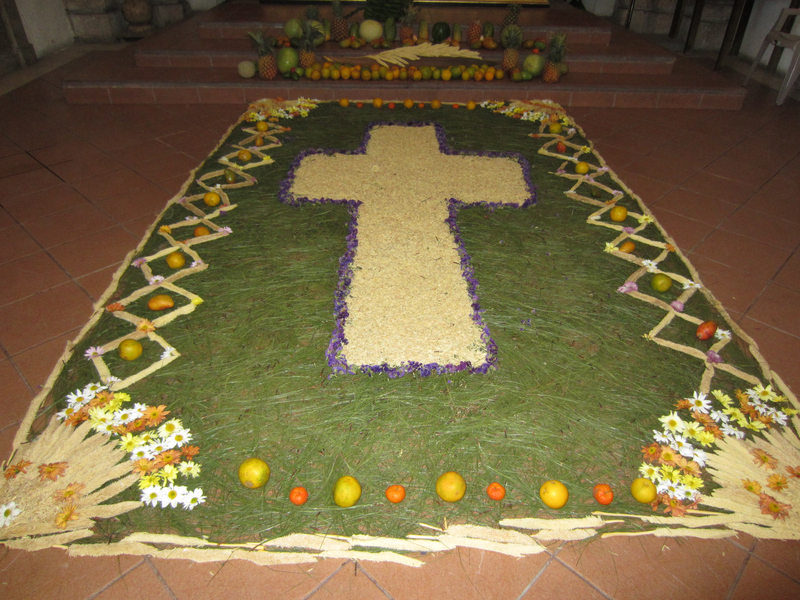 Alfombras are usually decorated with flowers as well as different fruits and offerings. What makes them so unique and amazing is the tremendous amount of work that is involved and the camaraderie among family and friends who create them together. 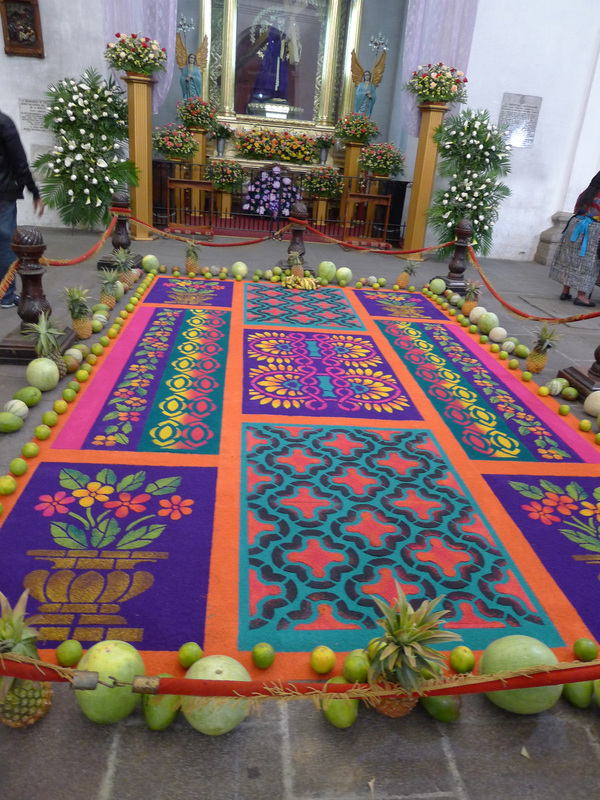 The alfombras are unique to Guatemala and originated back in the 16th century by the marriage of Spanish and indigenous influences. 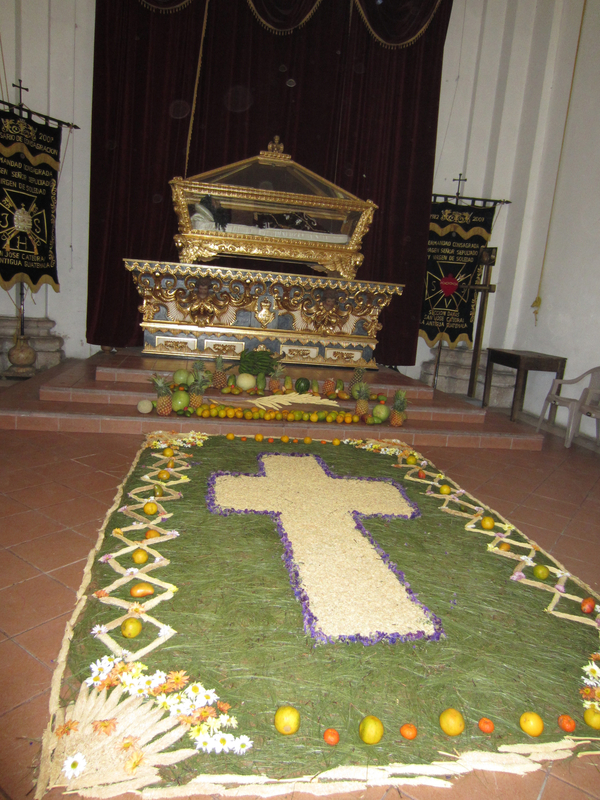 Later in the day, Lucy and I visited another church where we were surprised to find another alfombra, this one was absolutely striking. This alfombra above is one of my favorites. The colors were so incredibly beautiful and bright that I had to take several pictures from different angles. It is also well adorned with fruits and flowers, representing rebirth and an offering. I can only imagine what this weekend has been like in lovely Antigua as the Semana Santa celebrations come to the ultimate climax. I am certain it is an experience one would never forget. I look forward to reading my friend and fellow blogger Lucy’s (of Loca4Motion) next post. I am certain it will be fabulous and show me what I missed. A few days ago when I was watching TV there’s the news of Holy Week celebration in Antigua, and I remember you who just returned from that town. All the men wore purple robes and white gloves and the whole town immersed in the festivity. What a sight! By the way, the latter alfombra in this post looks amazing! Hi Bama: What a coincidence! I guess it is truly that popular so I could see it would be on TV. I would love to go someday. I think being in another culture on one of their religious celebrations is amazing. I remember being in India and Nepal for the Festival of Lights. It was so beautiful. I wish our holidays were as beautifully celebrated like that. Nicole, this week has been mayhem in Antigua! I’m exhausted after days of walking around town and to a neighboring pueblo taking photos of countless alfombras and processions. Tomorrow there’s a tiny joyful procession, a complete contrast to the solemn ones of the past month and it’s my favorite. After that, rest and hours sorting through my photos! Could be a while before my next post! By the way, you would have gone crazy with your camera if you’d been here!!! I am not even slightly religious, but I love the colour and enthusiasm of these events. I think you and I are on the same page here! I am not religious at all but enjoy watching the festivities. 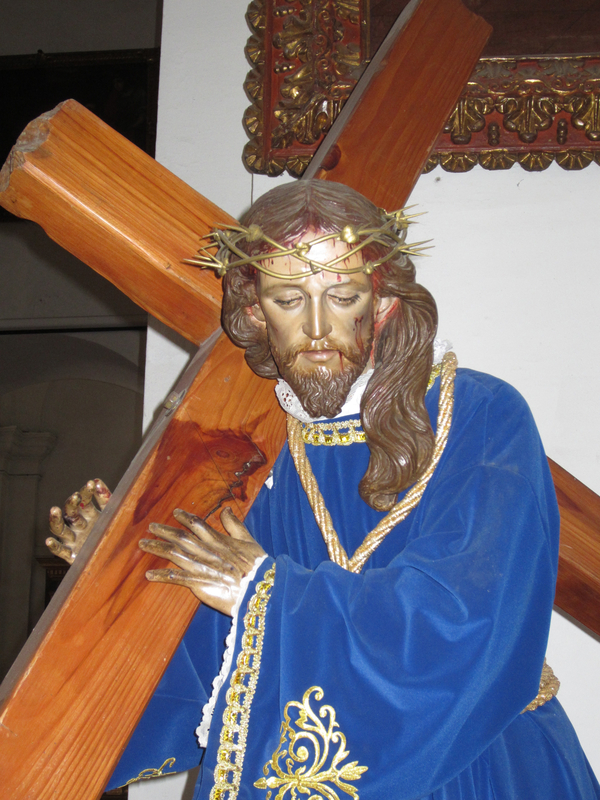 I was in Costa Rica during Holy Week and was amazed by it all. This reminds me so much of my time in Spain. Some of those wooden floats they use are hundreds of years old! I was in Seville about a month before Holy Week and there were already people practicing the walk with an empty float. 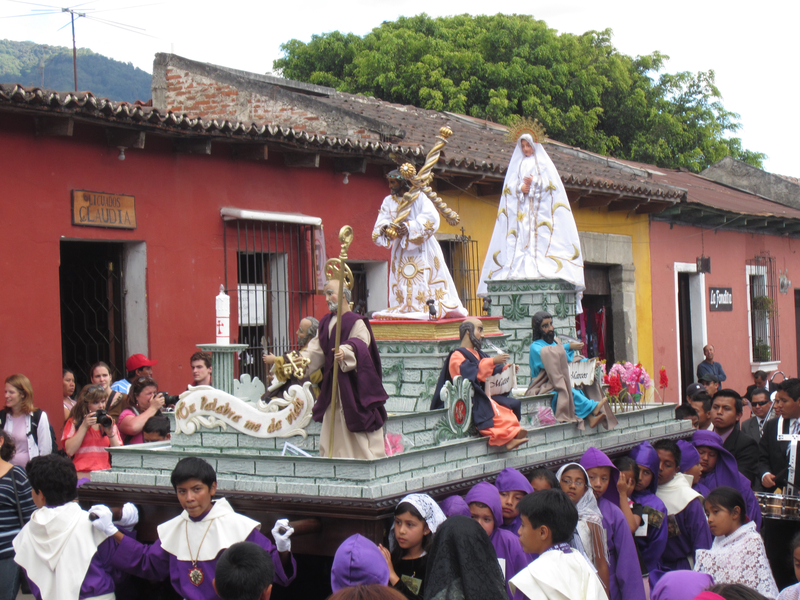 Semana Santa seems to be a huge event in the former Spanish colonies – there are processions like this as far away as the Philippines! Yes Semana Santa is huge there. 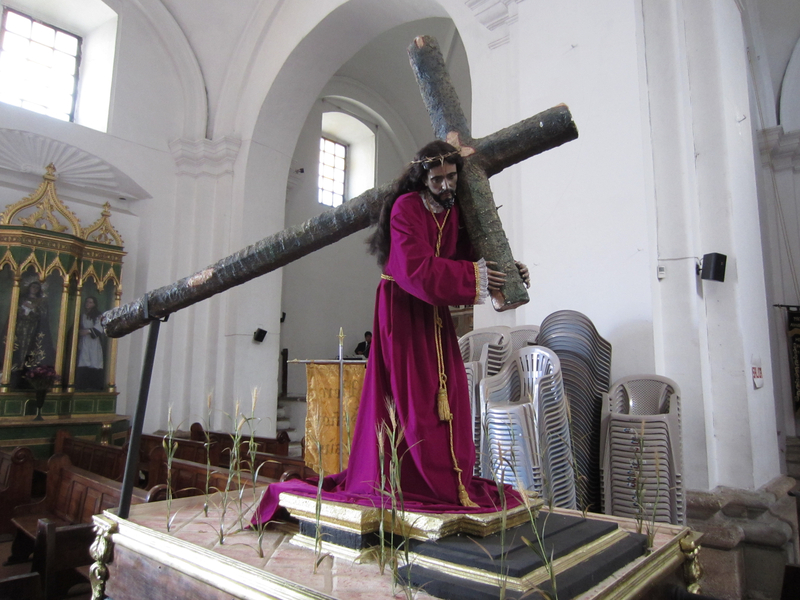 I heard from a trusted source that Antigua’s Semana Santa has become more renowned than Seville’s. I have been to Seville during the Feria’s but I’m not sure that is a religious festival. Glad you got to be there for Ash Wednesday. And, gosh, that rug is gorgeous! Happy Easter, my friend! Your pics are a treat! Especially the colourful Alfombra’s! In India (mainly the South) people do something similar with coloured rice flour! 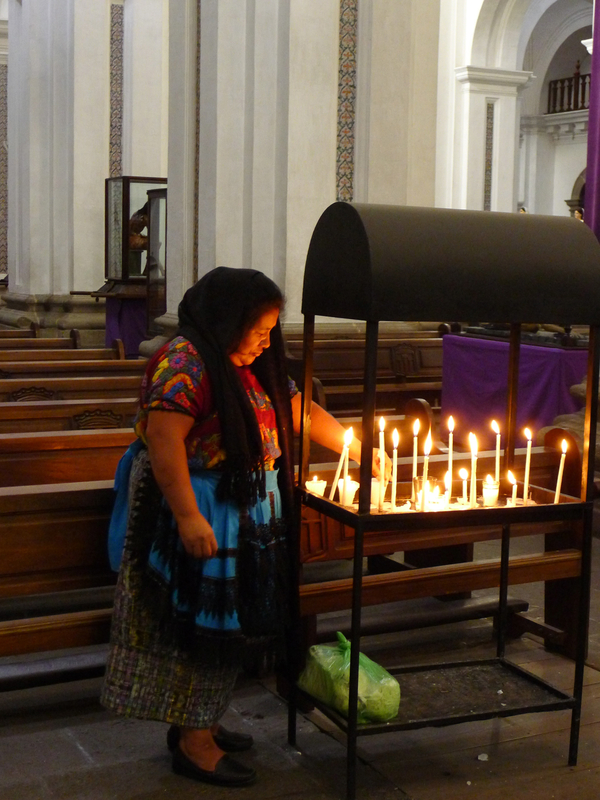 And in Peru, October is known as the ‘Purple Month’ in homage to ‘the Lord of the Miracles’! Thanks! 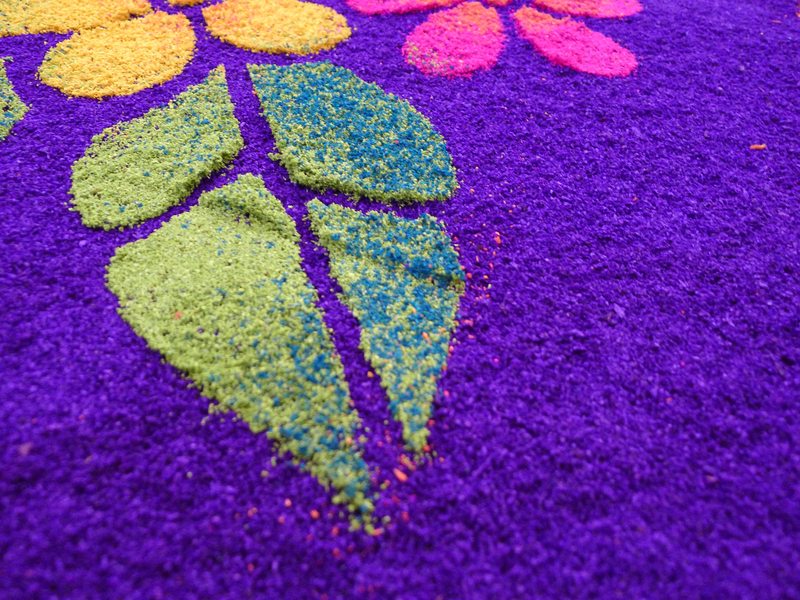 I do remember seeing the dyed rice in India and Nepal when I was there for the Festival of the Lights. It was gorgeous! Ahhhh….I hope so! I would love to hike up Pacaya! THere is another blogger I follow who hiked there and his photos are amazing. The lava was pouring out in broad daylight! I told myself…I have to do this someday!!! I am such a wanderlust! 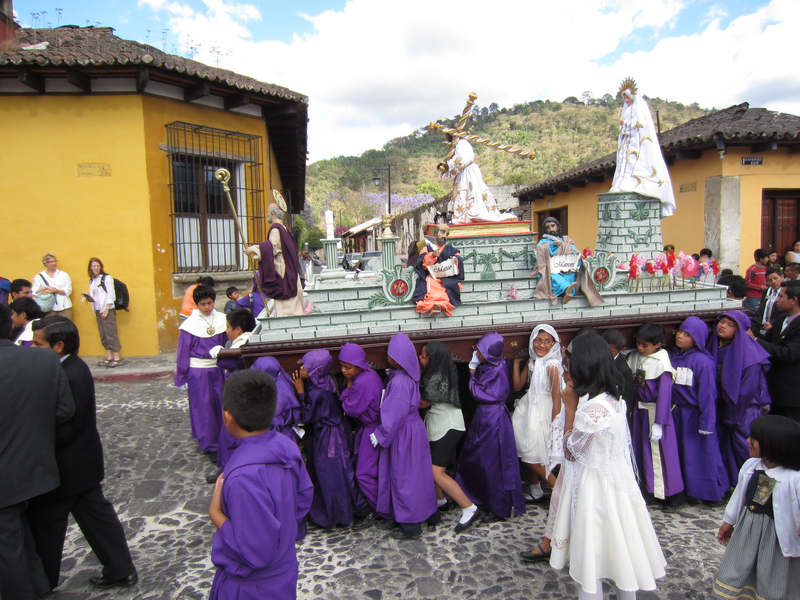 In honor of Good Friday and Holy Week, I thought I’d repost one of my all time favorites, “A Slice of Semana Santa” from lovely Antigua, Guatemala. It’s funny but I never think of this as being a particularly religious world anymore, Nicole, but when it comes to Easter and the processions, how can you doubt it? Beautiful work! I have seen sand pictures in the north of Tenerife, but like yourself, didn’t time it right for the whole Easter experience. Nicole, I´m missing this time of year so much in Antigua!!! It´s so busy and chaotic but incredibly atmospheric and beautiful!! !